Greetings, faithful reader, and welcome to our lineup of the top rangefinders for 2017. Whether you’re hunting or just target shooting, it’s often a good idea to have some way of accurately judging your range to target. A high-quality rangefinder is almost indispensable, but there are far too many choices out there. Some are good, some bad, and some in the middle. I’m here to take some of the pain out of choosing a rangefinder, by giving you a rundown of the what may be the best hunting rangefinder of 2017. Leupold is well known to rifle hunters for its scopes, but the company also produces some of the best rangefinders money can buy. In the past, the lineup has been geared more towards rifle shooters than archers, but the FullDraw 2 shows Leupold improving on its offering to bowhunters. Incorporating the manufacturer’s Digitally eNhanced Accuracy (DNA) technology, this rangefinder offers supreme precision and accuracy, giving readouts to within one-tenth of a yard. It does so quickly and consistently, and that fact alone makes the rangefinder worth every penny Leupold charges for it. It gets better, though. The dedicated bow mode is always active, and gives you the equivalent horizontal range for all your shots. That takes the guesswork out of determining how far above or below you the target is, helping you decide which sight pin to use for your shot. Leupold has also integrated its Trophy Scale feature into the FullDraw 2, which allows you to instantly and accurately judge the width and/or height of that buck before you take your shot. The maximum range is advertised at 865 yards, but that’s to a large, highly reflective target. A deer is not that, so count on a maximum range of around 300 yards with this model (Leupold says 750 yards, but that’s not been my experience). The high light transmission LCD does a decent job of gathering light and showing your readout against shadows, but it’s still not the greatest for use in low-light conditions, unfortunately. 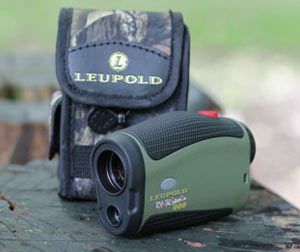 The Leupold Fulldraw 2 rangefinder is definitely in the running for best hunting rangefinder of 2017. For a more indepth review of visit our Fulldraw 2 by Leupold review. To check pricing on this rangefinder, click here. 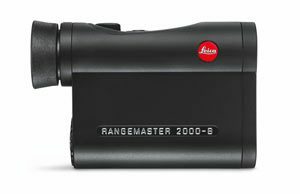 One of the best rangefinders on the market, the Leica Rangemaster is a feature-rich option that is still easy to use. It’s accurate out to 2,000 yards, providing quick and consistent readings. Of course, that range is to a large, highly reflective object — you’re hunting deer, which are smaller. Expect to get a good reading on that buck from up to 300-400 yards away. The display is a red LED, and it’s easily legible in any lighting condition. The Rangemaster is powered by a single 3-volt CR2 battery, which can be hard to find in rural areas. While it should last you a full year, I always recommend carrying a spare “just in case.” Power consumption is good, since the device powers down automatically after a few seconds of inactivity. The rangefinder offers both single-shot mode and scan mode, so you can track multiple targets or keep an eye on the range of prey that’s on the move. This model provides you with line-of-sight distance to your target, as well as equivalent horizontal distance for objects that are uphill or downhill from you. This information is available for anything up to 1,200 yards away. Unfortunately, there’s no dedicated bow mode with this rangefinder, but you likely won’t need it. The Leica Rangemaster’s display and quality puts it in the running for best rangefinder of 2017. More details on the Leica Rangemaster. Click here for the latest pricing on this rangefinder. This is a top seller, simply because it’s pretty soft on the budget while still providing good accuracy and features. The Bushnell Bone Collector Edition doesn’t have the pinpoint accuracy or extreme zoom that more expensive models have, but it’s still a worthy competitor. 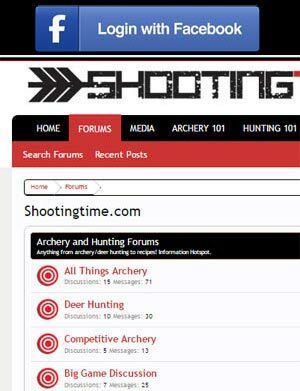 It advertises a maximum range of 600 yards, but expect more like 200 yards for deer. This rangefinder is accurate to within +/- a yard, which isn’t the most stellar accuracy in the world but is still pretty good for bowhunting. If you’re looking for a rangefinder that offers an archery mode, you should look at another model. The Bone Collector Edition only provides line-of-sight distance, without any ballistic compensation details for rifles or bows. One of my favorite features of the Bone Collector Edition is that it uses a standard 9-volt battery instead of the harder-to-find CR-type power cells. It’s also quite good as far as power consumption goes, shutting off automatically after a few seconds of inactivity. What’s really troubling, however, is that this rangefinder isn’t waterproof or fogproof. You have to baby it a bit, since the slightest bit of moisture can get into the optics chamber, fog up your view, and render your rangefinder out of commission. It is covered by Bushnell’s Bulletproof Guarantee, but I’m not sure they’d honor that on a device that’s advertised as not being weather-resistant. More details on the Bushnell Bone Collector Edition. Click here for the latest pricing on the Bonecollector rangefinder. 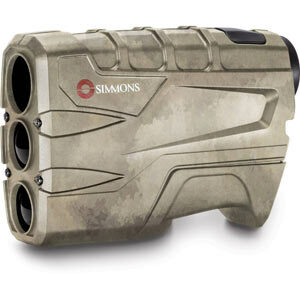 This rangefinder is Team Primos-approved, and it’s definitely made for bowhunters. It offers angle/range compensation for trajectories to plus or minus 90 degrees vertical. That means you will know what the true horizontal distance is to your target, no matter how far uphill or downhill it is from you. This bow mode is available from seven to 199 yards, so it’s definitely useful for any bowhunting situation. The Truth also has ClearShot Technology, to provide you with instantaneous feedback on whether or not your shot is obstructed. The magnification is only 4X, but that’s usually plenty for bowhunting scenarios. The rangefinder gives you lightning-fast measurements with excellent consistency. Unfortunately, this rangefinder isn’t fogproof or waterproof. It’s rainproof, but if you drop it into a puddle you’ll probably regret it. It’s also not very effective in low-light or extreme cold temperatures; the display is barely readable during early morning or late evening hunting times, and the optics chamber fogs up pretty easily in frigid weather. More details on the Bushnell The Truth with ClearShot. 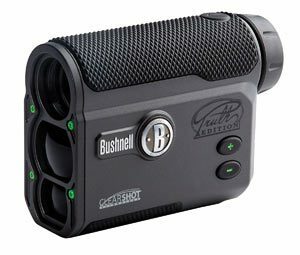 Click here for the latest pricing on the Bushnell The Truth rangefinder. Now we get to another Bushnell model, the Trophy Xtreme. This model offers deer ranging accuracy out to 200 yards, with a total range of 850 yards for a large, highly reflective target. 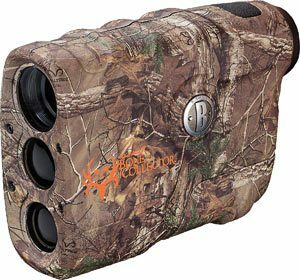 The full-spectrum targeting built into this rangefinder makes it a cinch to get distance even to dark or shaded objects. The Trophy Xtreme has Bushnell’s ARC bow mode, giving you true horizontal distance from seven to 199 yards. This model doesn’t have ClearShot technology, so you’ll have to look carefully to make sure brush, limbs, branches or other obstacles aren’t in the way of your shot. With 4X magnification, you should be good except for the most extreme shots. Measurements are quick and consistent. This model, like The Truth, is rainproof but not waterproof or fogproof. I found it didn’t fog up too badly, but it does suffer from some murkiness in the display when it’s really cold out. The readout for range information is a black LCD, which can be quite difficult to read in low-light conditions or when you’re ranging a target that’s in shadows. More details on the Bushnell Trophy Xtreme. 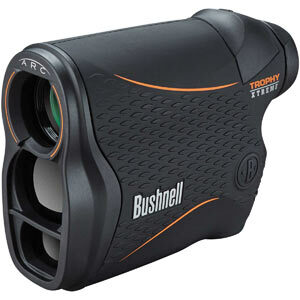 Click here for the latest prices on the Bushnell Trophy Xtreme rangefinder. This is a pretty simple rangefinder, which might be all you need to get started. It offers a range display from 10 to 600 yards, assuming your target is highly reflective and large. 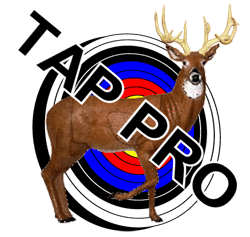 For deer, expect to be able to get an accurate range out to 150-200 yards. It operates on a 9-volt battery, which is easy to find, but replacing the power cell requires a flathead screwdriver. This model doesn’t have an inclinometer, so it cannot determine your true horizontal range. It also doesn’t take into account ballistics of your bow, so you will only know the line-of-sight distance to your target. That’s all well and good if you’re hunting in relatively flat terrain, but you might consider a different model if you regularly hunt from a tall treestand or in hilly or mountainous terrain. With all of that said, if you’re on a tight budget and need something to get you in the right ballpark, the Volt 600 will do that without damaging your pocketbook too badly. Just bear in mind the pros and cons before you decide on this budget-friendly rangefinder. More details on the Simmons 4x20LRF 600. 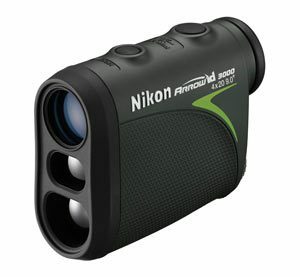 Click here to check the latest prices on this rangefinder. Nikon tends to produce some of the best optics on the market, but it also has its fair share of duds. The ARROW ID 3000 is a pretty decent rangefinder, offering some terrific features for bowhunters. It provides quick and consistent measurements, providing range on deer from as far away as 200 yards. The maximum range for a large, highly reflective target is a mere 550 yards, however. Then again, since this rangefinder is built solely with archers in mind, that’s not a problem unless you’re looking for a rangefinder that’s going to serve multiple purposes. The built-in ID (Incline/Decline) technology helps provide you with the true horizontal distance you need to make the most accurate shot. It doesn’t matter if you’re shooting uphill or downhill, the ARROW ID 3000 will help you know exactly which sight pin to use. For crossbow hunters, the rangefinder is compatible with Nikon’s Spot On Ballistic Technology to help you determine the exact range needed to choose the correct aiming point on your Nikon crossbow scope. The housing on the ARROW ID 3000 is rainproof, but it’s not waterproof. It also isn’t fogproof, as I discovered to my dismay one early morning when the temperature was in the single digits. Fogged right up. For diehard hunters, this is a travesty, but there’s another serious drawback — early morning hunters won’t be able to read the display, because it’s a black LCD. Finally, more than a few consumers have had to send their ARROW ID 3000 in for repair or replacement, making me believe that quality control might be an issue for this model of rangefinder. More details on the Nikon ARROW ID 3000. Click here to check the latest prices on this rangefinder. We hope this may have narrowed down the rangefinders you look at in your search for the best rangefinder of 2017. A good rangefinder is one of the most important accessories you’ll need while hunting so go to your local hunting store and try them out for yourself. High quality optics – You want a clear, crisp image. Waterproof and fogproof – You want to be able to range animals in all conditions. Optical zoom – You want to pierce surround twigs and branches to ensure you are on your animal. Quality display – You want to be able to read the yardages in low light conditions. You should be able to get a good feeling for all the key features we listed above in your local sporting goods store. Good luck in finding the best rangefinder you can for this upcoming season. Happy hunting!